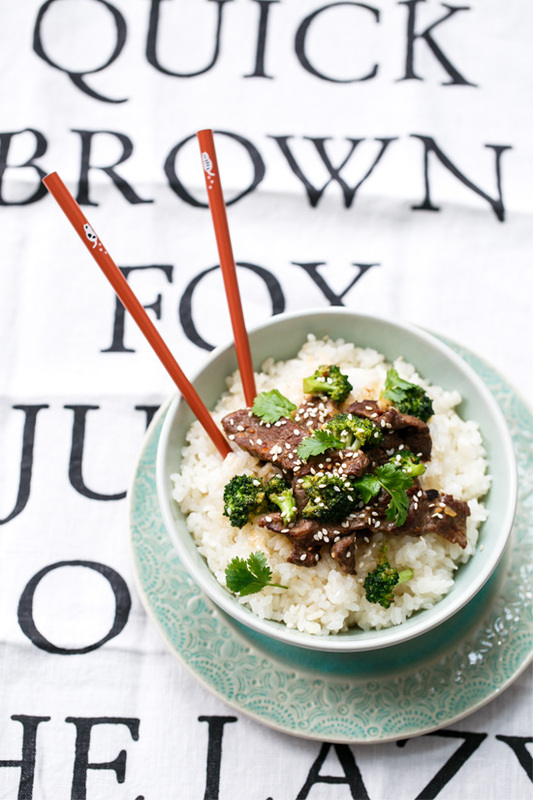 Beef broccoli meets Thai coconut curry meets stir fry rice bowl, in this glorious mashup that you’ll adore. Take-out shmake-out, I mean, really, who needs it? The thin slices of steak practically melt within a savory coconut broth spiked with soy sauce and lime. Served over a generous bowl of sticky sweet coconut rice, it makes for a hearty and satisfying meal. And aside from the sweet rice which requires a few hours of pre-soaking, this recipe comes together in about 30 minutes. We don’t make stir-fry nearly as often as we used to. One too many platters of soy sauce-drenched tofu and we kind of wore ourselves out. But this recipe has us back in the game, and it’s easily one of our favorite recipes to date. 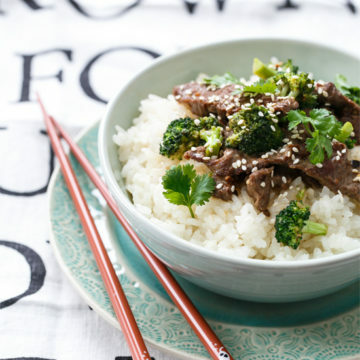 The thinly sliced strips of Thai-seasoned beef (we like flat iron, but flank or skirt would work just fine too) are quickly stir-fried in coconut oil, then tossed with tender broccoli florets and a sweet and savory coconut milk-based sauce, all on a bed of coconut-infused sticky rice (which we’ve used in the past for our Asian-style Loco Moco). Sticky rice is also called glutenous rice even though it, like other rice varieties, is entirely gluten-free. It’s called this because it gets sticky and almost glue-like when cooked. We like to sub in a bit of coconut milk in place of the water to give the rice some extra flavor and natural sweetness. It requires less liquid than normal rice, and we like to soak it for 6-8 hours beforehand to speed up the cooking process (though it’s done in about 10 minutes). Don’t eat red meat? Not a fan of broccoli? This recipe is easily modified to suit your personal tastes. Replace the beef with chicken or tofu. Swap in asparagus or pea pods for the broccoli. Fill your bowls with steamed jasmine rice or brown rice or even rice noodles. Double or triple the sauce and eat this more like a soup than a stir fry. Not physically, as I’m about as flexible as a chopstick. Touch my toes? You may as well ask me to lick my elbow. When it comes to recipes, though, flex all you want. This recipe can take it. Combine rice with 1 1/2 cups cold water; cover and refrigerate for 6 to 8 hours. Pour rice and any remaining liquid into a saucepan. Stir in coconut milk and bring to a boil over medium heat. Cover and reduce heat to medium-low; simmer for 10 minutes, or until rice is tender and liquid is absorbed. Remove from heat; keep covered and let stand for at least 5 minutes. 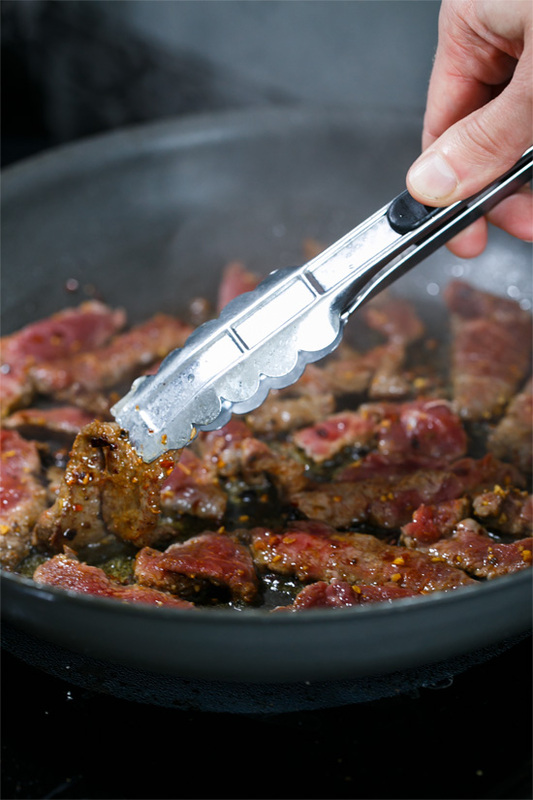 While rice is cooking, toss sliced steak with Thai seasoning until evenly coated. Heat 1 tablespoon coconut oil in a large skillet or wok over medium-high heat. When pan is very hot, add 1/3 of sliced beef, spreading into a thin layer. Saute for 1 to 2 minutes per side or until beef is starting to brown but still slightly pink the middle. Transfer to a plate. Repeat with remaining beef, adding more coconut oil to the pan as needed. Return skillet to heat. If necessary, add a bit more oil, but the residual drippings from the beef should be enough. Add shallot, garlic, and ginger and saute until fragrant, about 30 seconds. Add broccoli and cook until bright green, 2 to 3 minutes. 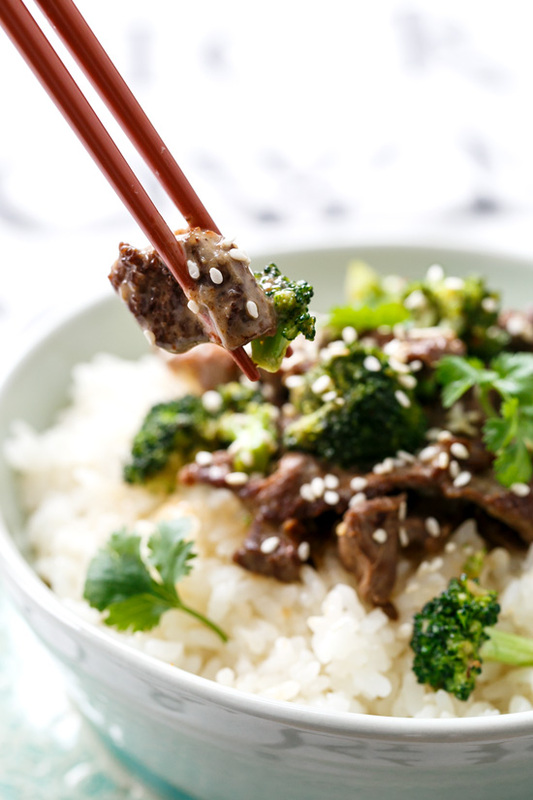 Add coconut milk, soy sauce, sugar, and lime juice and simmer for 2 to 3 minutes or until broccoli is tender and sauce is thickened and reduced. Add beef and cook, stirring to coat evenly with sauce, until heated through. Divide rice among 4 serving bowls. 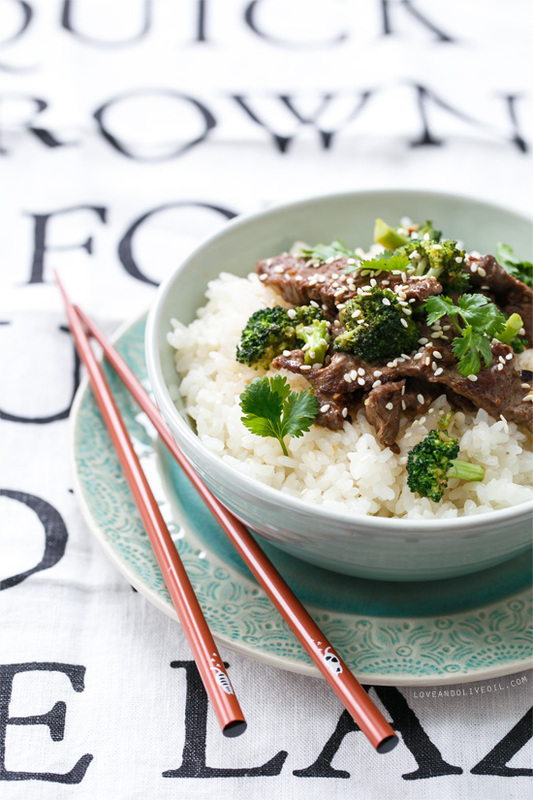 Top with beef broccoli mixture, then sprinkle with fresh cilantro and sesame seeds and enjoy. *Sold as Sho-Chiku-Bai sweet rice, or sometimes just called sweet rice, white sticky rice can be found at specialty grocers and Asian food stores. You can substitute other types of rice here if necessary (sushi rice is the closest in terms of stickiness), just follow the cooking instructions on the package, replacing 3/4 cup of the cooking water with coconut milk.